Here's how you refund unapplied financial aid to the source. You have already disbursed and posted the aid to the student's account. In other words, you cannot refund an award that is still in Setup mode or has only been scheduled. If you're using the DOE integration, the disbursement should have been accepted by COD. You schedule the refund on the student's Profile > Financial > Financial Aid view. You complete the refund using a refund batch in Financial Aid > Awards. Financial aid refunds to the source use the workflow described in this article. Aid refunds to students require the workflow described in this link. 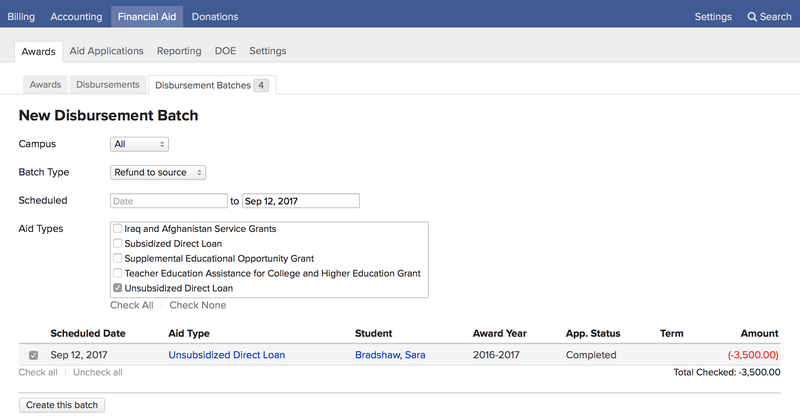 The refund-to-source process begins on the student's Financial Aid view, where you schedule the refund. Locate the award from which you need to issue a refund. Under that award, click Refund to source. In the dialog, enter the refund amount and the date on which you wish to schedule the refund. Now that you've scheduled the refund, it will show up in the award's panel among the disbursements. You can also find it in the Awards > Disbursements report. At this point, the refund has only been scheduled; it does not yet affect the student's account in any salient way. 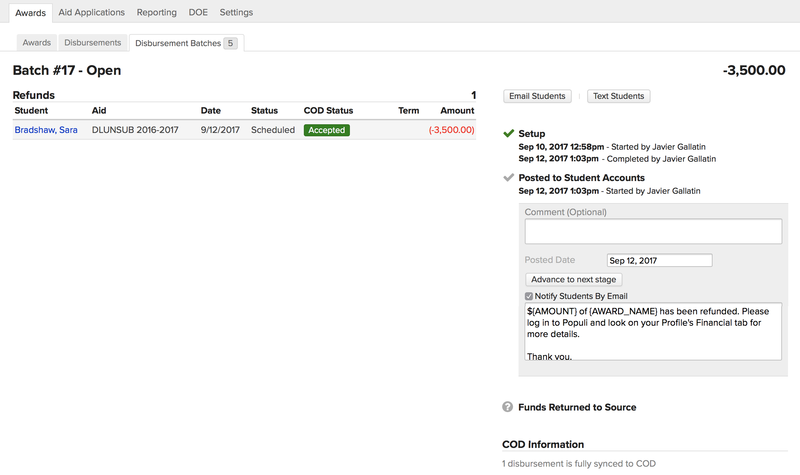 Now that you've scheduled the refund, you'll need to run a batch in order to post it to the student's account (and sync it with COD). Go to Financial Aid > Awards > Disbursement Batches. Next to Batch Type, select Refund to Source. Use the date fields to filter for refunds by their scheduled date. Check the aid types you wish included in the batch. When you're done filtering, you can check the boxes next to the refunds you wish to include in this batch, or uncheck the refunds you wish to exclude. Next you run the batch through its steps. Refund batches have three stages. You can cancel the batch while it is in setup, but not afterwards. During the Setup stage, you can still make changes or cancel the batch. Populi tells COD that the original award amount is to be downward-adjusted. The adjusted amount is recorded in Populi as the COD Amount. This is because COD cannot record negative transactions, as would be expected for a refund. Populi shows you the award in the original amount together with the refund to source. When you're ready to complete the batch, you can notify students by email that the refund has been posted. You can also change the posted date, if desired. Click Complete batch; this closes the batch to further modification. Do you have directions on what to do for a partial refund to source? Such as a student who drops a class, receives Populi credit, etc.? Thanks! I am still running into this issue. I have a student who enrolled full time, remained in all classes, received credit balance funds, then dropped a class. This creates a sales credit on the student's Populi record. To refund the credit balance, the dialog box that opens limits the refund source to 1) Payments/Credits (non-aid), 2) Federal Aid, and 3) Non-Federal Aid. The sales credit is actually federal aid funds (Pell). When I choose option 2, the max value to refund is 0.00. This is the same for option 3. I am only left with option 1, showing the sales credit amount. Option 1 clearly states it is non-aid. Do I ignore that and post it anyway? ?